If you have feedback on how government programs can work better, you should submit public comments. Agencies are required to address your comments, and they really listen. They need to hear from more Americans outside the beltway. I had never heard of public comment before I went to work in the government. So if you haven’t either, that’s not a problem. It’s why I wrote this! Government regulations (often called “regs” or “rules”) matter a lot to Americans’ lives and jobs. In healthcare, where I spend my time, they are the critical backbone of how the industry functions. Regulations include payment rates for Medicare, criteria for evaluating the cybersecurity of medical devices, and definitions of patients’ access rights to their medical records, and so much more. Whenever an agency is proposing either brand-new regulations or changes to existing ones, they must do it in two phases. First the agency will post a draft and ask the public to comment on it. Anyone can comment: experts in the field, startups, corporations, lobbying groups, concerned citizens. This first draft is called a “proposed rule” or a “Notice of Proposed Rule Making” (NPRM). The agency leaves the draft out there for usually 30–90 days (they must post the due date for comments), and then they take all the comments and go back to their offices, read and digest the comments, and write a final version. Legally, the agency is required to address all comments in the final rule — which means they must truly consider commenters’ ideas and issues, and the implications. It also means you can see what comments were submitted by others. Typically, the rule changes quite a bit between the first and final drafts, largely due to public feedback, mostly through comments, but also including listening sessions and other open feedback forums. This proposed rule from CMS will open up new APIs for patients to get and move their data. The big green button is where you submit your comments!! Major industry players and trade groups almost always submit comments. Meanwhile, there are unfortunately lots of groups who rarely do, like startups, individual doctors, engineers, product managers, security experts, user researchers, and people from families who struggle with the exact scenarios being discussed. These are the exact groups who we most need to here from. They’re the ones who deeply understand what needs to change, what the nitty gritty details are, and how it can be done. Agencies need to hear from you. Agency policy teams get to spend very little time on the ground in healthcare. The system is designed for them to rely on datasets, public forums, and the public comment process to help figure out what is truly happening, and to identify the likely effects of regulatory changes. While I would also like to see America develop a more outcome-driven, iterative process, right now the public comment is one of the strongest feedback and iteration tools of the US policy process. It is all of our responsibility to make government programs the best they can be, with the most pragmatic and patient-centered implementations possible. Regulations must all be posted on the Federal Register, where users can search based on many criteria. Unfortunately it isn’t always easy to find exactly what you’re looking for- usually the agency will have some very specific language from their press release that you can use. 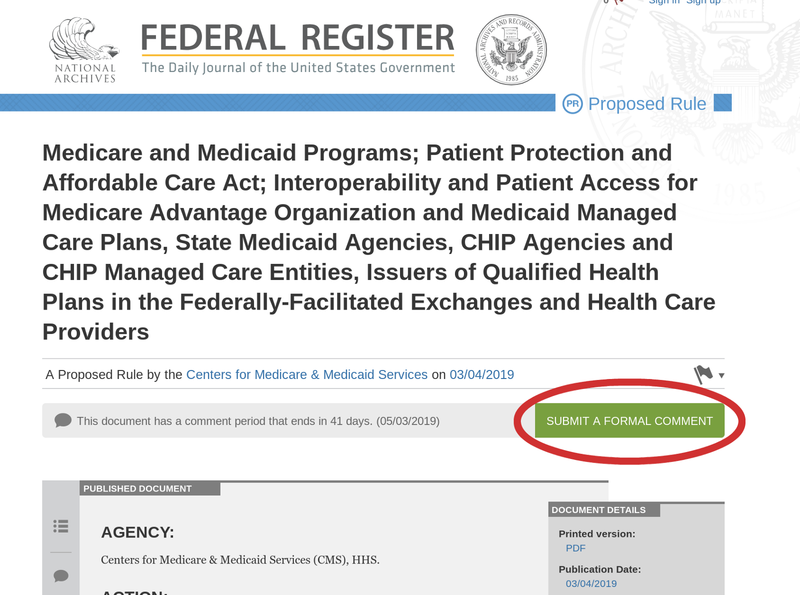 Once you find the rule, you click on the big green button that says “Submit a Formal Comment” (circled in red above) and then you paste your well-prepared and thought-out comments into a text box that pops up. It will also ask for your name, address, and the organization you represent. And that’s it! You’ve now offered important feedback to your federal agency. Now’s the time to add more voices to the conversation. Get out there and comment! Government geek, healthcare entrepreneur, builder. Founded the US Digital Service@ Health & Human Services, now I run Product at Devoted Health.